Arguments about the impact of Navy sonar on marine mammals rose to the highest court in the land last fall. But not every issue is best settled in court. One source of knowledge related to the case—marine mammal scientists—was essentially left out of the debate. The U.S. Supreme Court weighed competing interests—“a balance of harms” in legal terms. On one hand is the potential threat to whales from sonar; on the other, the military risk posed by naval forces inadequately trained to use sonar to detect enemy submarines. In November 2008, the justices cited the public’s overriding national security interests and ruled that, in the absence of direct evidence of sonar-related whale deaths in whale-inhabited waters off California, the Navy could continue sonar training exercises there. However, the justices also upheld arguments by the National Resources Defense Council (NRDC) and other environmental groups that the Navy should continue “monitoring and mitigation measures” to prevent harm to marine mammals. “The ruling was procedural; the case did not hinge on science,” said Darlene Ketten, a biologist at Woods Hole Oceanographic Institution (WHOI) who specializes in marine mammal hearing. “Neither side wanted to discuss research that has developed new methods to better protect whales that will still meet the Navy’s training requirements, and I’m not quite sure why,” said Peter Tyack, director of the Marine Mammal Center at WHOI, which has a mission to provide research in support of marine mammal conservation. 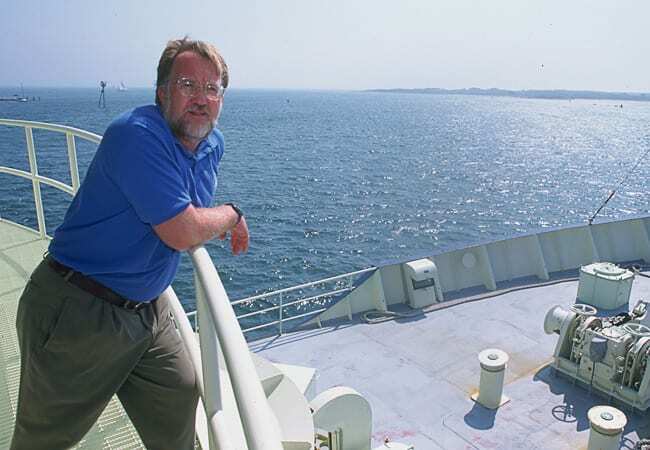 For example, he said, there was disagreement between the Navy, which turns off sonar when whales or dolphins are seen within 1,000 meters of a vessel, and the environmental groups, which argued that the shutdown range should be increased to 2,000 meters. 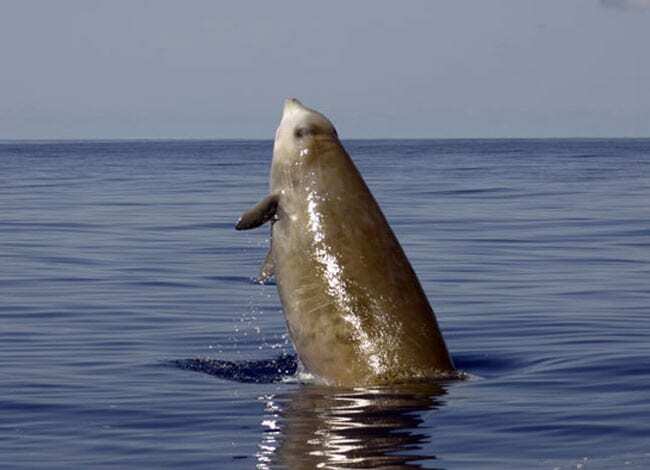 But the whales that have most often beached and died during sonar exercises are beaked whales, which are elusive and difficult to see at the surface. Environmental groups sometimes exaggerate sonar risks with emotional arguments that attract public attention but are scientifically inaccurate, Ketten and Tyack say. For example, Kendall asserted that marine mammals near a sonar source experience a sound equivalent to 2,000 jet engines, causing them to get decompression sickness, or “the bends,” if they surface too rapidly. On the other side, analyses by federal regulators and the U.S. Navy may not fully account for all sonar risks, Tyack said. The Navy has agreed that sonar in some situations may cause beaked whales to strand on beaches and die. 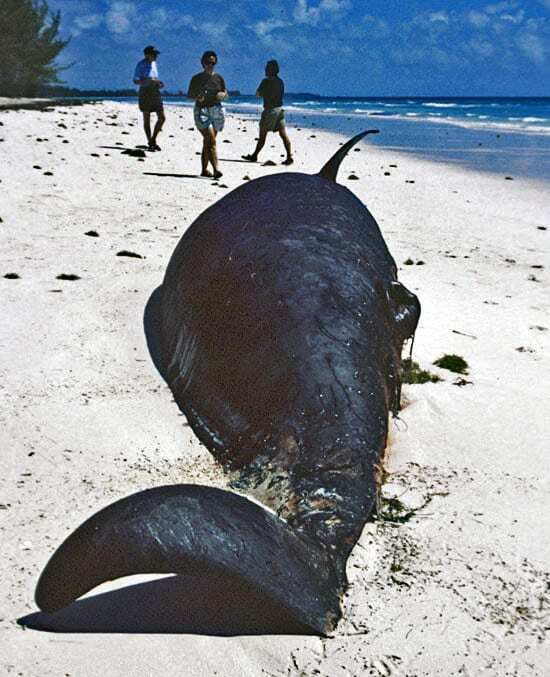 In current environmental impact statements, the U.S. Navy notes a link between sonar and 37 whale deaths in five stranding events worldwide since 1996. However given how little information is available, the problem may well extend beyond these 37 whales. Sonar may have a host of other effects on marine mammals, such as stress, disorientation, hearing loss, and disruption of feeding, that may have important impacts but would not be evident in the stranding record, he said. Ironically, most scientists and U.S. fisheries managers agree that far more marine mammals are killed in fishing gear than by sonar. A study by Andrew Read, of Duke University and colleagues presented to the Scientific Committee of the International Whaling Commission in 2003 estimated that 300,000 whales and dolphins are killed in fishing operations per year worldwide. By contrast, a 2004 paper by Barbara Taylor of the U.S. National Marine Fisheries Service and colleagues presented to the Scientific Committee of the International Whaling Commission, listed fewer than 200 whales stranded coincident with naval maneuvers in the last 40 years. “When the courts and the public do not get an accurate picture of the threats posed by different human activities to marine mammals and other wildlife, it distorts conservation priorities and does not serve the interests of the animals,” Tyack said. A recent technological invention—digital tags that can record whales’ behavior and the sounds in their environment—has vastly increased scientists’ ability to learn how whales respond to sonar, he said. The Navy funds much of this research (see The Sound of Sonar and the Fury about Whale Strandings). 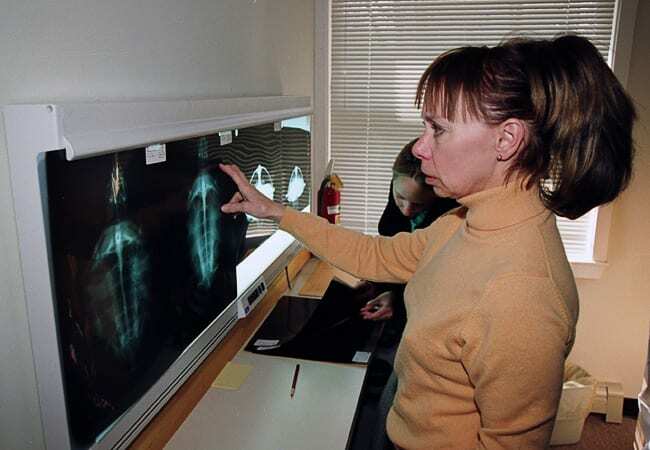 “It’s ironic to think it’s the human squabbling that is preventing the science from informing the policy,” Tyack said. See letter to the editor from Joel Reynolds of the Natural Resources Defense Council. 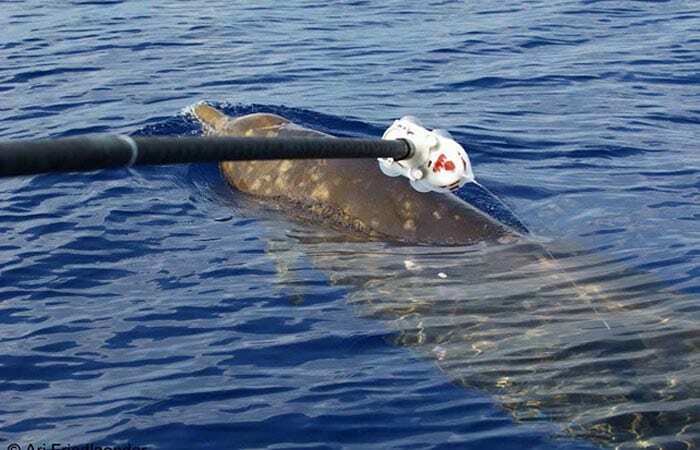 Digital tags recently developed at Woods Hole Oceanographic Institution attach non-invasively to whales, then release after a few hours. 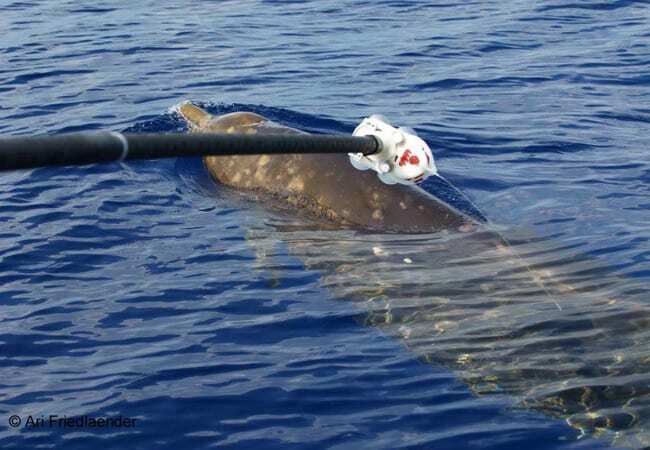 After this beaked whale was tagged, the device recorded data about the animal's behavior and information about the surrounding ocean environment. The tags have increased scientists’ ability to learn how whales respond to sonar. The research was conducted under a permit issued by the Bahamas Department of Resources and under permit # 981-1707 issued by the National Marine Fisheries Service under the authority of the Marine Mammal Protection Act and the U.S. Environmental Protection Agency.